In this process, we utilize two metallic wires that are electrically charged with opposing polarity as the coating feedstock. This will cause them to throw a molten arc between each other. We will next inject inert gas or high velocity air to trigger an atomization of the now-molten material and propel onto the substrate to form the coating. 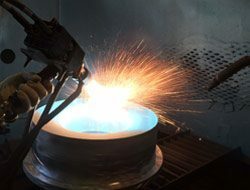 If you opt for the electric arc spray process, we can spray any type of metals which have melting points below 10,000°F. Depending on the equipment being used and the material being applied, A&A Coatings can provide metallic coatings with either semi-metallurgical bonds or mechanical bonds up to 5000 P-S-I. Distortion will not occur because the substrate is not exposed to high temperature over 250°F. In this process, the basic principle of the heat source is the same as wire spray except that powders are fed through a flame and propelled by high velocity oxygen or air onto a substrate. As with the metalizing process, any powdered metal or ceramic having a melting point below 5500°F. can be sprayed. This process is mainly used for abradable coatings and spray/fuse hard surfacing. In this process, we feed the spray material in wire form into a fuel gas-oxygen flame where it is melted by the heat (temperature up to 5500°F) of that combustion. Compressed air is concentrated around the flame, atomizing the molten material into fine spherical particles and propelling these particles at high velocity onto a the substrate. We can manipulate the atomization and the melting of metals with different melting points when we control the feeding rate of the wire through the flame. When you opt for this method, we can spray any wire as long as it features a melting point below 5500°F. A&A Coatings has many proven years of expertise in metalizing processes, and we have high performing machining facilities, lab facilities and a well established engineering department to fulfill your needs. Call us today to request information on any specific metalizing materials or processes that you are interested in.